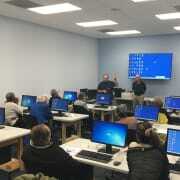 Working with Hispanic Unity, we are looking for Bi-lingual Teachers and Teacher Assistants to teach basic internet skills to senior adults in Spanish. Class is held at the Gulfstream Early Learning Center in Hallandale. Requirements: Must enjoy working with older adults, have patience, ability to think on the spot and inspire to help others to improve their social and economic security. Have skills to teach basic word processing, online searches, sending and receiving emails, navigating online portals, online safety practices, using google maps and YouTube. Preferred Requirements: Volunteers who are 55+ years and older, have teaching experience and familiar with gmail. The Teacher will lead a computer class of 8 - 10 students. You will have a book and online demonstration for teaching tools. Each class is a mix of brief lecture, discussion, hands-on practice, further discussion and review. Teacher time commitment is 6 total hours per week (3.5 hours class time, up to 2 hours planning time). Assistant time commitment is 3.5 total hours of class time. Class times are Tues & Thurs Contact us to learn more.